Time to Play Super 6? Is it time that you had a go at SkyBet’s weekly Super 6? The fact that it is free to play should be enough to tempt pretty much all fans to have a go, but when you throw into the mix that there is a potential £1 million in cash to be won, you’d have to be crazy not to want to get involved – especially if you follow the football anyway and have a reasonable guess as to how well each team is performing. If you’re not already playing, you are missing out – the chance to win big without even putting a penny of your own money at risk! Sky’s Super 6 is one of a number of ‘recruitment tools’ that big bookmakers are using to try and get you to set up an account with them, and have a punt on their site – they are taking the calculated bet that once you’re on their site each week for the Super 6, you’ll also have a cheeky accumulator bet, and maybe one on Harry Kane (even if he’s not set the Premier League on fire just yet) to net first in the big game on Saturday. But just because they want to, doesn’t mean you have to (save your money for the other betting offers from other bookmakers that are out there week after week! ), and we recommend that you just sign up and play the Super 6 for free. The fact that you can download the app to your phone, and even set reminders to make your selections before kick-off, means that there can be no real excuse – you can literally submit your entry in 2 minutes flat, and with absolutely no effort whatsoever! 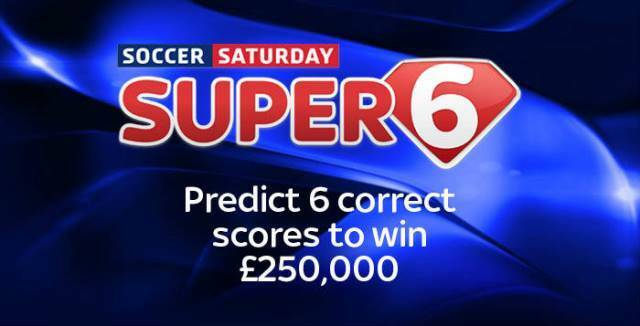 To win the Super 6, you need to correctly predict the score of the 6 matches chosen by SkyBet. It’s a bit like an accumulator bet, in that you need all 6 results to come in, for you to take the money. Most players can get at least one of the scores right, but it takes a lot of intuition / luck to get all 6 correct, especially in the unpredictable game of football, where mistakes happen, goals can be scored in seconds, and referees can make borderline decisions (like sendings off) that will directly impact the results. If you get all 6 scores correct then you claim your huge cash prize! If someone else has also managed to get all 6 results too, it comes down to the ‘Golden Goal’ prediction – you pick a match and put your guess as to when the first goal will be scored in – with the nearest prediction taking the spoils. If no-one guesses all 6 scores, a £5000 cash prize goes to the player who got the most right. There are a few fan websites / facebook groups that try to predict what the scores would be, but they tend to be happy amateurs, having a bit of a guess in their lunch hours. At FootyAccumulators, they have experienced betting professionals (who actually do it for a living!) who make their suggestions on their Super 6 tips page. Obviously, it’s difficult to predict (believe it or not, SkyBet don’t actually want to give out the million quid every week…), but the FA team have done reasonably well at getting at least 3 of the scores correct for the last over each gameweek. Their top super 6 tips are to follow the form – if a team is in good form then they should have a better chance of carrying on, with that all important ‘momentum’. To do the job right you also need to have a closer look at their goal scoring / conceding tallies – when a team that is knocking them in for fun faces a team that concedes them like they are playing in the playground, it can be anybody guess what the end score will be, but you can bet it will be big numbers! Comments Off on Time to Play Super 6?